Sure, you can buy Google Glass sans invite on Tuesday if you live in the U.S. Or perhaps you want to wait, seeing that Samsung has ideas for its own wearable display. 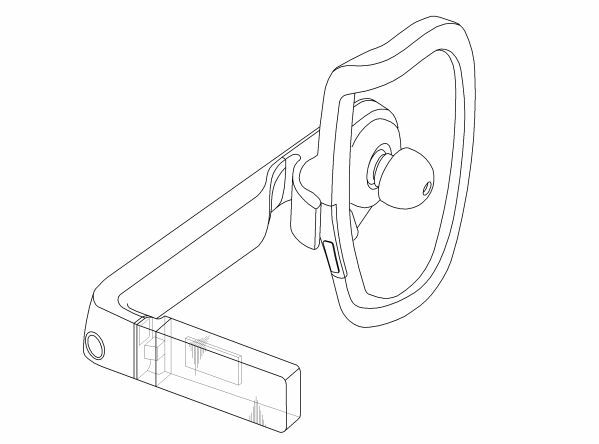 The company recently applied for a patent through the Korean Intellectual Property Office with a design that bears more than a passing resemblance to parts of Google Glass(s goog). The patent application filed earlier this month was spotted by the Dutch Galaxy Club site and noted by SamMobile. Unlike Glass, Samsung’s “Earphone” product doesn’t have two arms to fit over your ears like traditional glasses. Instead an in-ear headphone with clip holds the device to a users head. The differences stop there, however. Just like Glass, the Earphone design has a heads-up display viewed through a prism. And that prism rotates forward and back for viewing adjustments. There’s also a microphone on the device as well as a front facing camera and what looks to be a camera button on the top of the device near the headphone. Of course, there’s no mention of the software that will run the Earphone; that’s not at all surprising for a design patent. I’d think that Samsung won’t use Android in such a product, however. After using Google’s platform on its first wearable, the Galaxy Gear smartwatch, Samsung switched over to its own Tizen software for follow-up devices such as the Samsung Gear 2. Samsung has continued to develop Tizen with likely hopes of reducing its reliance upon Google from a software perspective. The company already has S-Voice, software that can be used to interact with a mobile device, which would work as a hands-free interface for the Earphone if the product does come to market. They need an app that analyzes an image of whoever is in front of you and assigns them a number (based on their size, expression, maybe muscle definition, etc…) to help you gauge if you could take them in a fight. They could call it a “power number” or “strength level” tour something. Copying apple got Samsung kicked in the behind, so they decided to copy Google now. I’m sure Google wouldn’t mind if it ran android, bit if tizen – Samsung is biting the hand that feeds her. Iâ€™m sure that somebody will figure out how to project this information less obtrusively. However, watching people walk around with this tech is frightening. And frankly, the value add outside of business is nearly zero. I want my Apple eyePhone! !